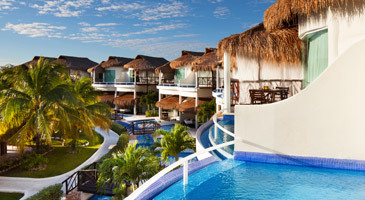 Nestled along the beach in a separate, secluded area within the El Dorado Royale Resort complex on Mexico's Riviera Maya, El Dorado Casitas Royale, a Spa Resort by Karisma is an adults-only resort designed for romance. Experience the heightened pleasures of being together in this Gourmet Inclusive® resort. Relax in your private, picturesque casita directly on the beach and enjoy an ultra-luxurious space complete with an in-suite whirlpool. Savor gourmet dining at 9 different and delectable restaurants. Indulge in rejuvenating spa services, including the popular couple's massage classes. Splash into 12 swimming pools by day, then join in the exciting nightlife.